Following another successful brick match for a client in Surrey, it’s been pointed out to us just how important a service like bespoke brick matching really is. Traditional clay bricks are formed, then kiln fired in batches and produced in various quantities. To ensure there is a sufficient amount to complete the project, brick quantities would need to be secured and purchased in advance. If left with excess at the end of the build, this can have a negative financial effect on your project spend. Alternatively, what happens if you under order, and stock is in short supply? Due to the principle of supply and demand, you’ll need to pay a premium to secure your requirements. Once the supply of that particular brick design has gone locally, you need to start looking far and wide for more. Naturally, if this happens in the middle of the build, it can lead to delays, cost implications and ill-feeling from the client, developer and/or contractor. Imagine if your chosen brick is no longer made, or all stocks have been exhausted. Turnaround times for new bricks to be made will vary, but our research suggests it may well lead to a wait of around 26-52 weeks – long enough to significantly postpone work and impact your budget. This is where one of our greatest strengths comes into play – our bespoke brick matching service. What is a bespoke brick match? When you struggle to find stock, we are here to help. If you provide us with images or samples of the bricks you require, we will be able to match almost any brick. We take into account the colour, texture, finish, and any other specific details. Then, our expert team get to work to match the bricks as closely as possible. We send you samples for your approval, and once we’ve received your order details, we plan your job into our Production schedule. Here at Monolith Brick & Stone, we take a different view to production. All our bricks are manufactured on a per order basis, ensuring that there’s no wastage on a build. If more are required, we simply refer back to our production pack and make more. The benefits of this approach are numerous and obvious. You simply buy what you require. If there’s a quantity issue, simply order more. Our production turnaround times are minimised, given you’re an existing customer. As you will be well underway with application of our products, we will prioritise your additional order within Production, and ensure we will do our best to help you out. We produce our bricks in-house using high quality, composite mortar. We do not source brick from elsewhere, are not reliant on availability, and are very competitive with product turnaround. If you can imagine it, we can try and make it! The handmade nature of our product means we can adapt to suit most styles of brick including those less common, impossible to find, or yet to be created! Our brick slips are massively less water absorbent than clay slips, meaning the building will shed water and remain dry. Environmentally better: Our products are not kiln fired and have less environmental impact. 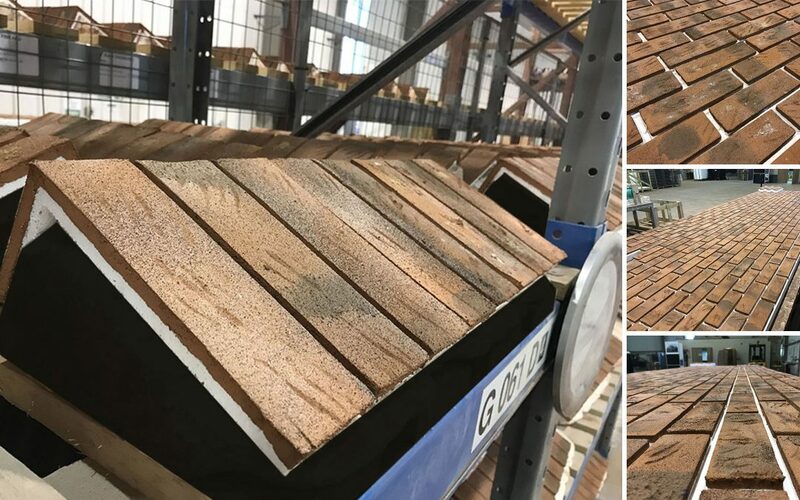 They are lighter than traditional brick, so we can fit more on pallets for delivery, reducing delivery costs and the associated fossil fuel consumption. As another happy customer gets ready to receive their order, we move on to our next job in the Production schedule. Want to be next? Call us on 01745 535 855 or email orders@monolith.build with your requirements, and we’ll start the process to get you your own brick match! We are the leading independent specialist manufacturer and distributor of enhanced brick & stone products for the construction industry. Based in the North West of Wales, we serve both national and international customers. Registered in England and Wales. Company number 09876675. VAT number (GB) 234619213.